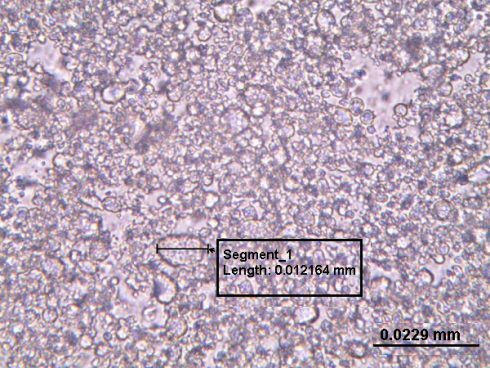 Voronezh State University of Engineering Technology conducted a study of milk fat polymorphism using our Altami Studio program and Altami BIO 1 microscope. In terms of milk fat, the phenomenon of polymorphism has been studied for a long time, and its essence consists in the ability of glycerides to form various crystalline structures (polymorphic forms) during solidification, differing in the character of elementary crystal lattice composition, the shape of crystals, melting points, and other properties. When mixed crystals are formed, this feature (polymorphism) inherent in individual triglycerides is kept. In the production of butter, the phenomenon of polymorphism can presumably have some influence on the formation of butter physical structure and its consistency. Currently, the market of combined fat-and-oil products, spreads, is increasingly gaining use. For this reason, it is necessary to address the issues of polymorphism in combined fats to improve the consistency and the efficiency of physical processes in emulsions of the combined fat composition. Under the hydrogenated reaction, and, accordingly, with the different fatty acid composition polymorphic changes in the mixtures of milk fat with various vegetable oils were investigated. “Altami BIO 1” microscope with a trinocular attachment of the Gemel type, equipped with a digital eyepiece camera based on CMOS Aptina sensors was used for the micrographic investigation. Photographic registration of spread fats crystallization was carried out with the help of Altami Studio 3.4 licensed software package. Native preparations obtained “ex tempore” were used for the investigation. Spatial location of milk fats, vegetable fat, moisture droplets, air bubbles and their interrelation directly affects the storage stability of the spread, its organoleptic and physicochemical parameters. The interrelation of the structural elements that make up the product is determined by the microstructure. During physical maturation the formation of the butter physical structure starts already in the partial crystallization process of milk fat glycerides in fat globules. Directly depending on the parameters of emulsification it continues during the mechanical processing of the emulsion. Due to the structuring of its components the final stage of structure formation occurs during storage. Thus, the structure of the spread developed by the method of FA transformation is formed from separate fat particles that solidified during the physical maturation of cream, globules and “fragments”, as well as glyceride crystals of various sizes and shapes located between the globules. The dimensions of air bubbles play an important role in the formation of the structure, so one of the problems was the maximum air distribution in the entire volume of the emulsified mixture. Picture 1 shows the structure of the mixture at the beginning of the emulsification process and prior to the emulsion exposure. Structureless fat mass was being detected. Pic. 1.The beginning of spread emulsifying process with combined composition. At the end of emulsification, the investigated spread had a homogeneous granular structure, with a uniformly distributed plasma throughout the whole product, without large-sized voids, which accelerates the microbial spoilage of the product and reduces a shelf life of the product. Such a product has good plasticity and thermal stability in comparison with the control sample (Pic. 4). Thus, microstructural analysis allowed to visualize the process of uniform formation of the multicomponent spread structural characteristics during the emulsification. In addition, the “Altami BIO 1” microscope made it possible to obtain a high-quality image of the investigated emulsion and at the same time to obtain morphometric data for the formation of fat crystals using the Altami Studio 3.4 software package. Moreover, the wide possibilities of the software package are noteworthy in terms of information, in particular, thin measurements cannot be fulfilled without special equipment.